Centre Loving Hands Children's Orphanage was started by Faithful Baptist Church in 2002 and currently has 25 orphans in it care. 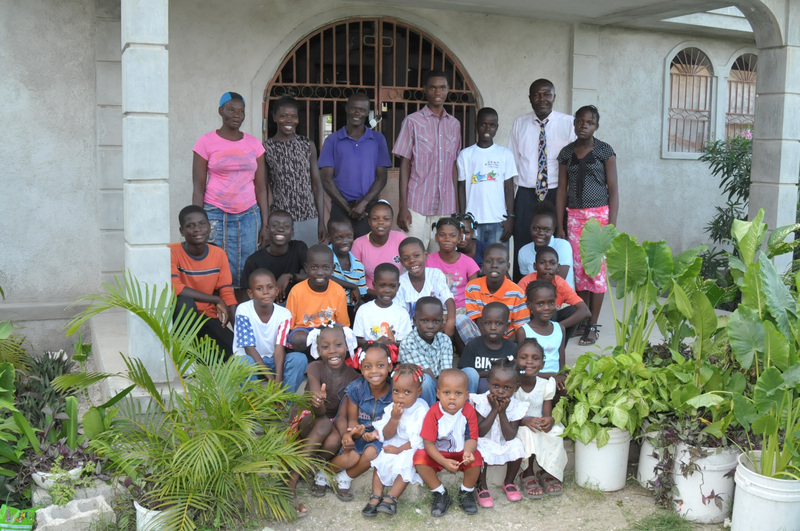 The orphanage itself is located on the grounds of the church which is located 10 miles east of Port-au-Prince, Haiti. Before the earthquake it also included a school that served the orphans as well as other children from the local village. The school was destroyed in the earthquake. When we visited the compound, they had built a stick & steel tin structure to hold classes in temporarily. The orphanage itself is 2 small buildings with all the children sleeping 2 per bed. The kitchen is a typical Haitian charcoal pit. The bathrooms are an outhouse with broken doors and they pump their water by hand into 5 gallon buckets. They had a system of pressurized water for a shower and toilet but the pump and tank where stolen after the wall surrounding the compound was damaged in the earthquake. Osner Dieudonne is the director of the orphanage. He is a man of great faith in God to provide for the needs of the children. His faithfulness reminded me of George Muller who started many orphanages in England in the 1800’s. Osners dream is to grow the orphanage to be able to take care of 50 children. Rebuilding of the school: The entire school complex was destroyed by the earthquake. Plans have been drawn up for an 8 classroom school house constructed out of concrete and block. Design, construction and furnishing of a new orphanage building: This building would be large enough for sleeping & feeding of 50 children. Would include proper bathroom facilities. Download plans for this project. Deralane Mirlande (13 / 2nd grade) - She was born in Delmas and has lost both her parents. Desire Jesula (15 / 5th grade) - She was born in Port-au-Prince and has lost her father. Her mother is mentally handicapped. St. Fort Marie Denise (13 / 5th grade) - She was born in Cite-Soleil and has lost both her parents. Dominique Moniteca (12 / 3rd grade) - She was born in Torcelle and has lost both her parents. Jean Savanica (7 / Kindergarten) - She was born in Artebonite and has lost both her parents. Paul Santa Naika (2) - She was born in Denis and her parents cannot afford to care for her. Breval Ruthnove-Renalda (9 / 4th grade) - She was born in Turbe and her parents cannot afford to care for her. Jean Cassalinda (8 / 1st grade) - She was born in Petubibute and has lost both of her parents. Dalisca Alfred Cassandra (3) - She was born in Terre Blanche and her mother cannot afford her. Paul Neftali (6 / 1st grade) - She was born in Denis and her parents cannot afford to care for her. Deralcine Stanley (16 / 6th grade) - He was born in cite Soleil and has lost his mother. His father is sickly and unable to care for him. Jean Steevenson (16 / 6th grade) - He was born in Croix-des-Bouquets and was abandoned by his parents. Dominique Olivier (10 / 2nd grade) - He was born in Torcelle and has lost both of his parents. Thomas Peterson (15 / 4th grade) - He was born in Delmas and has lost both of his parents. St. Victor John (18 / 9th grade) - He was born in Nazon and has lost both his parents. Paul Samson (4 / Kindergarten) - He was born in Denis and his parents cannot afford to care for him. St. Vil Joles (15 / 2nd grade) - He was born in Font Verette and is handicapped. His parents could not afford to care for him. Breval Mionove-Ernst (13 / 7th grade) - He was born in Turbe and his parents cannot afford to care for him. Dalisca Alfred Anderson (6 / Kindergarten) - He was born in Terre Blanche and his parents cannot afford to care for him. Breval Vans-Renaldez (11 / 7th grade) - He was born in Turbe and his parents cannot afford to care for him. Etienne Kervens (7 / 1st grade) - He was born in Bois Delma and his parents cannot afford to care for him. Dalisca Alfred Wensley (5 / Kindergarten) - He was born in Terre Blanche and his parents cannot afford to care for him. Dor Dhinio (8 / 3rd grade) - He was born in Turbe and his parents cannot afford to care for him. Etienne Esdras (13 / 7th grade) - He was born in Bois Delmas and his parents cannot afford to care for him. Double Harvest operates in third world countries to establish and develop agricultural projects by providing capital resources and implementing best practices to increase food production and to build the local economy. Our efforts in Haiti will be done in cooperation with Double Harvest.